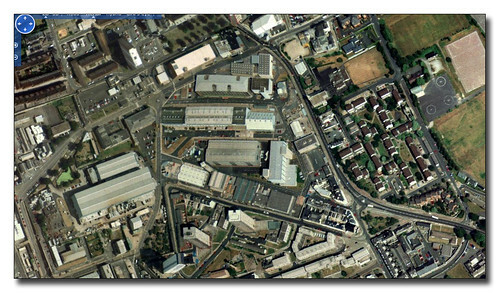 The third in out series of changes of the Plymothian Landscape as seen from above covers the South Yard redevelopment of Devonport where a large section of former MOD property is returned to civilian use. Here in the Microsoft image we see the South Yard section as it was before any of the redevelopment has started. All the old dockyard buildings are still present. The old dockyard walls are still in place. 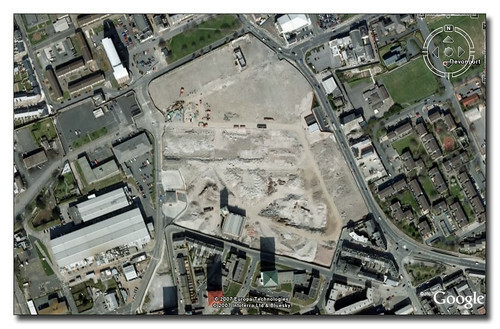 In the very latest image from Google Earth we can get a much better view of the scale of the redevelopment. Almost the whole site has been cleared although much of the outside walls are still in place. This is for construction site security. There is one small new building on the top right hand side of the site which is in use as a development office and viewing area where you can get a better idea of the development. It will be interesting to see the next image update for this area! Plans for the site include the provision of over 450 high-quality homes, a community healthcare centre, new supermarket and shops, offices and managed workspace. The historic Market Hall building will be retained and key areas have been allocated as public open space. 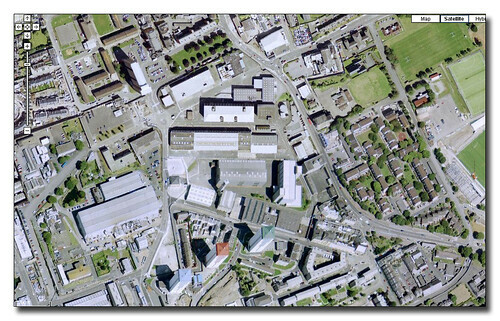 Plymouth data has a page for this site here which is well worth a look.